The guest bathroom makeover is complete! The construction part of the renovations on the bathroom and kitchen have been done for a few months now, and although the major stuff is done, I’m not quite sure how long it will take me to “perfect” the bathroom, so here’s where we are now. 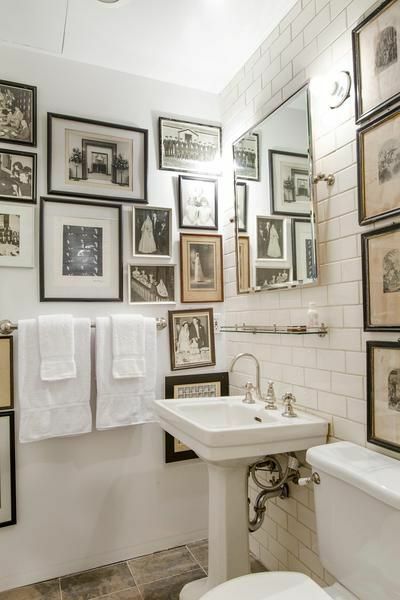 I wish I could find a before picture of this bathroom to show you – but you’ll have to take my word for it that it was all builder grade stuff in there. 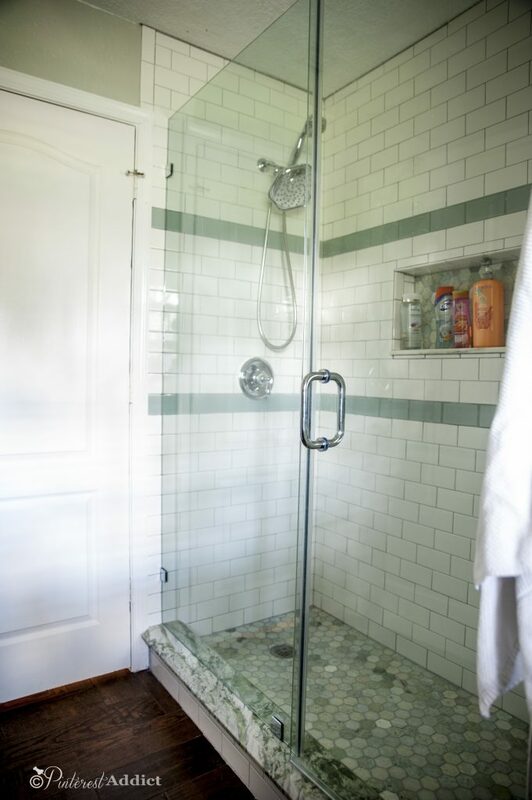 We used to have a tub in there, but we took that out and made it a walk in shower instead. Other than that change, the layout stayed the same. I know, it doesn’t look very interesting from that standpoint, right? With the window being off center, and it being the thing that you see from the doorway, it’s hard to bring personality into the room… I’m working on a plan (see the end of the post) that I think will work to bring some color and interest into the room. I still can’t find a mirror that I love for this space. I like the style of that one, but I can’t find anything like it in the correct size. I’m sure I’ll come across something at some point. I love the onyx counter. 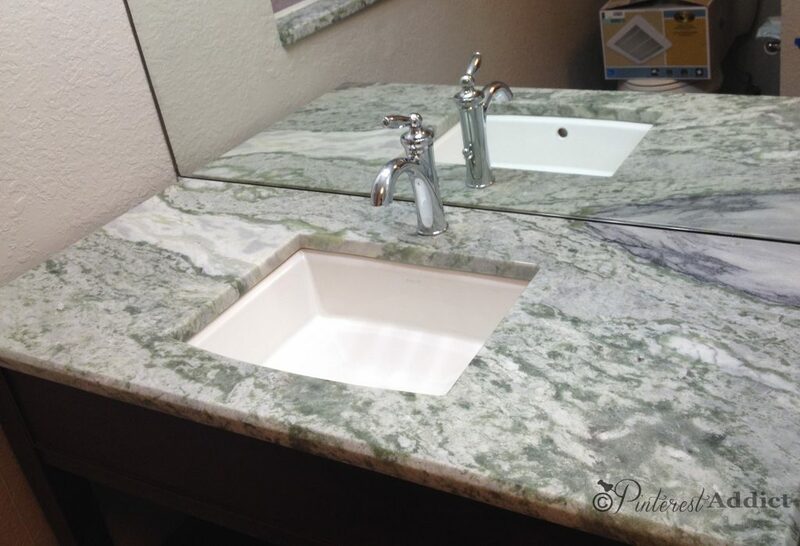 If you place a flash light under the sink, parts of the onyx will light up/glow. I love the greens, blues and grays that run through it. I love the Moen Brantford faucet and hand towel holder. They are traditional without being stuffy. Since everything else is so square, I love that they have a little bit of curviness to them. The sink is from Kohler, bought at Home Depot. I found that vanity at our local Habitat ReStore for $75. It was brand new – still in the original packaging. I can’t believe the stuff you can find there! 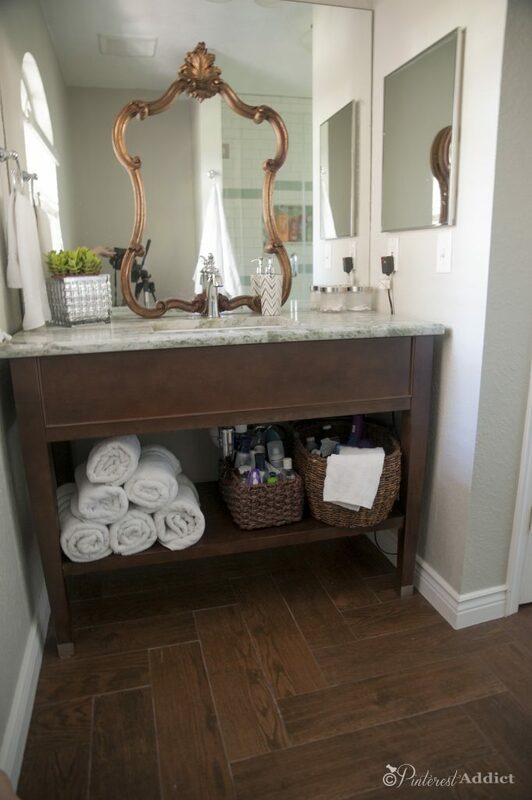 We are really lucky to have a large closet in that bathroom for storage, so the lack of closed storage area isn’t a problem in this bathroom. 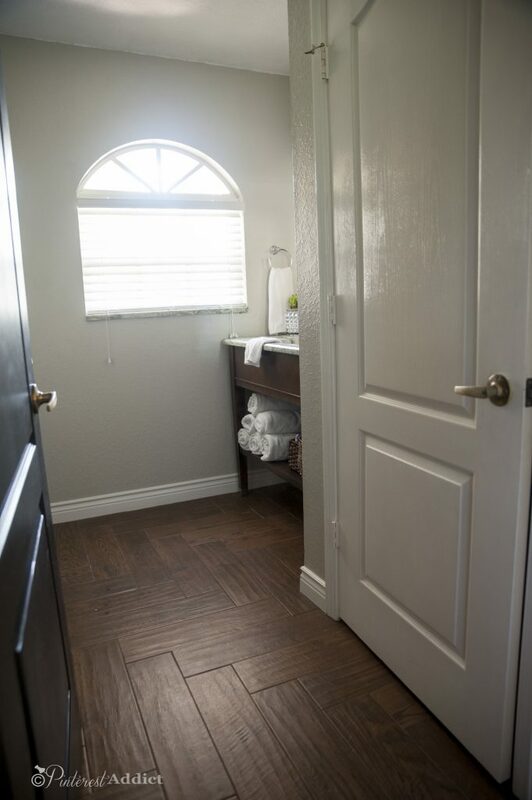 We continued the herringbone wood look tile into the bathroom, I love the warmth it brings into the room. I know the original plan was a completely different look from where we ended up. What can I say? 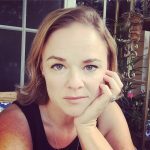 I change my mind – a lot. 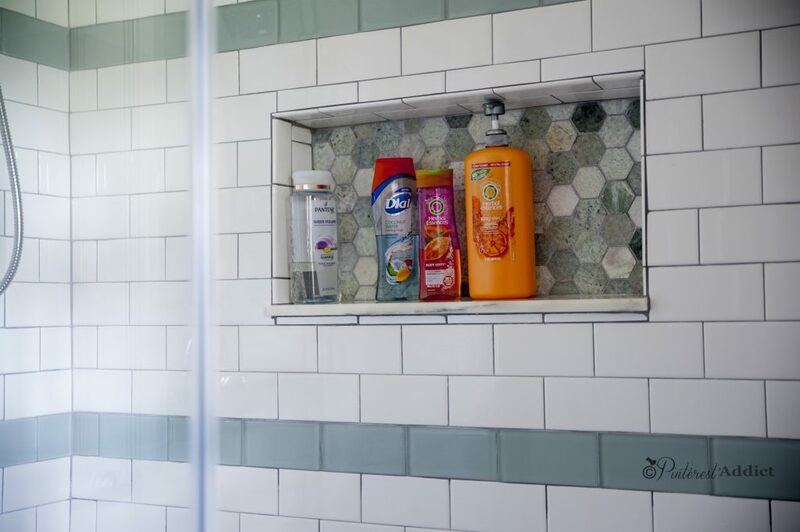 We ended up using subway tiles, and glass subway tiles for the accent rows. 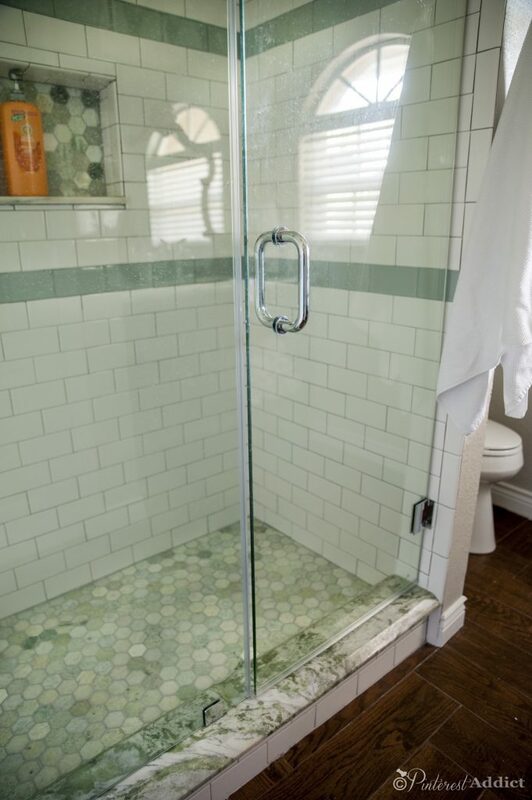 The shower floor and niche are green marble mosaic from Floor and Decor. The threshold is the same onyx as the counter. We used a light gray grout for both the floor and walls. The only regret I have is that we couldn’t use the larger subway tiles. They no longer made the bullnose for those tiles, so at the last minute we had to switch to the standard 3″ x 6″ size. I love the Moen double shower head. The dogs get their baths in this shower, so the handheld is perfect for cleaning them – and then cleaning up after them! Well, that’s the bathroom as of now. I am still trying to figure out a window covering – so many options, such a little window. 😛 As far as decorating the walls, I’ve been gathering pictures for the walls. I love this look I’ve seen all over the internet. As far as the color goes, once I find the fabric for the window, I might be changing that too. The gray seems a little blah to me next to the beautiful green of the counters. Disclosure: While Moen was kind enough to send me some of the fixtures for the bathroom, all opinions are mine. Great job!! You gave me some terrific ideas. Thanks much! I think I might just use my buffet as a vanity! I’m very excited! Gorgeous!! I love the floor of the shower! The details you’ve chosen are perfect! 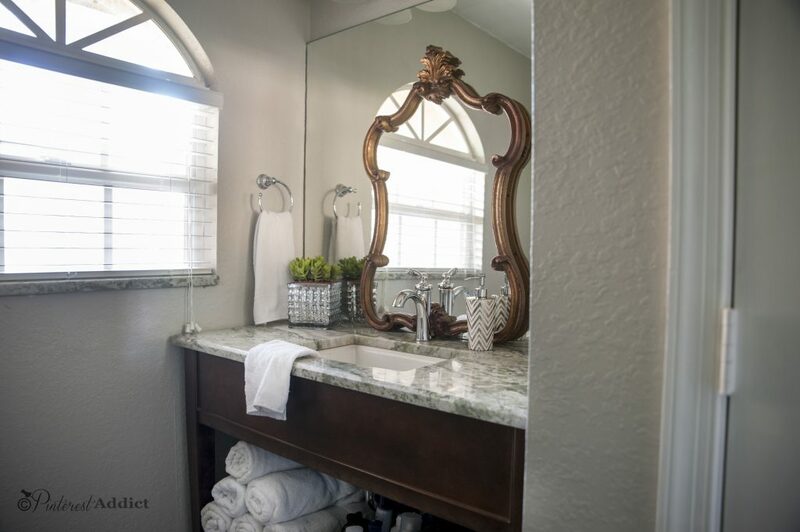 I love your mirror– mine is an Empire style and I really need something more ornate. It looks amazing!! What type of mortar did you use on the floor? Epoxy based?